Thanks, Sammi. I have googled the exp+ and have not been able to find an answer that way, either. Very frustrated about it. I know nothing about embroidery, but I did watch The Game! I think the towels look great! The white on the leaves? Think of it as snow! Hope you’re having a great Sunday! Your embroidery looks great! Have you looked at http://www.emblibrary.com? I also started with OESD designs, but they were just too expensive. I’ve had great results with Embroidery Library. Don’t have a Deco, but maybe this will help? Love the towels and the game was a good one. 🙂 Hope you find the answers that you need. I could change one to exp for oyu and see if you can see the colors on the machine? I wish I could help you with the embroidery. I have the whole set up for my pfaff and have never plugged it in because it confuses me. Have you tried using matching bobbin threads for your embroidery? I normally don’t use the white bobbin thread they say to use because of they would inevitably show up on the top. I always try to use matching threads, or thread colors that are close. That is essential when you do monogram. Are you aware of http://www.hatchedinafrica.com? Their designs are cute, and quite reasonably priced. I’m not sure if you have received any more info regarding embroidery conversions, but there are several software programs (inexpensive) that will convert your programs. The one that comes to mind is Buzz Tools. They have a website that you could look at and all the programs they offer are moderately priced. I have had embroidery machines since the beginning of time, and use the Janome Digigtizer Pro, but also find some Buzz Tool modules are very helpful. Hi – I found a comment from you on my blog from last March [before I knew what I was doing, lol] and decided to come visit – I’m glad I did! i’m going to add you to my Google Reader. Have you checked out Embird? http://www.embird.com. They make really good software for converting embroidery files, organizing them, doing all kinds of things including digitizing. And they’re reasonable. I have two Husqvarna machines and the old old software. I also use Wilcom Truesizer [it’s a free download] for converting files that my software won’t [because it’s old]. Also, you can join tons of yahoo groups that give away free designs – I used to belong to over 100 groups, and finally whittled it down. 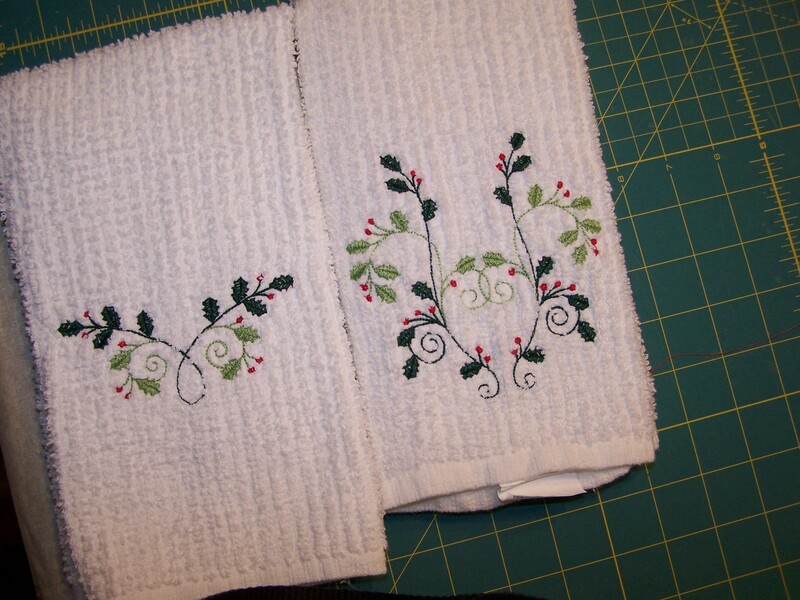 Just go to yahoo.com, groups, and do a search for “machine embroidery”. I also love Embroidery Library, but you do have to be careful, some of their stuff can be quite dense. I hope some of this helps! On your towels, it will help if you use a clear stabilizer on the top, It will keep the design from sinking into the towel. It really does help and will wash out. Depends on if you have a PC or a MAC. There’s plenty out there for PC, such as embird, but I’m on a MAC and just bought a Deco 340 so am looking for conversion software myself. I’ve tried StitchBuddy and it’s OK. But it only does EXP files. It has a separate color file but not .inf or .bmp. He calls it .threads so I don’t know if the Deco will read it or not. Now there is a converter program out there called ConvertIt but it’s $179. It will make all three .exp+ files needed. If I can’t get the Stitchbuddy files to work, I’ll need to buy it. I have some discontinued Laurel Burch CDs I’m not willing to give up.